Nothing comes easy, were the words of the President of Nigeria Labour Congress, Ayuba Wabba while commenting on the raging agitation for a new minimum wage of N30,000, which has pitched the organized labour against the federal and state governments for a while now. 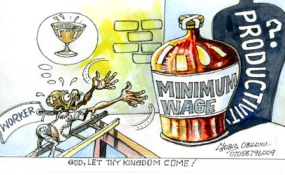 Wabba said the struggle for a of national minimum wage in Nigeria is never achieved but through workers' continous protests and agitations. According to him, workers have never in history got any increase in wage on a platter of gold. He argued that the struggle for a decent wage for workers shouldn't be an issue as it is the responsibility of a concerned government to strive to improve the welfare of its workers, who are the creators of the nation's wealth. Wabba said while the political office holders have always enjoyed fat salaries and allowances, the workers in history have always earn meager salaries. State governors have however said they could not pay N30000 minimum wage. According to them, any attempt to compel payment of the planned new minimium wage will force the states into bankruptcy. Lending voice to the clamour for a new national minimum wage of N30,000, which the NLC and TUC have given the present administration till January 23rd to transmit to the national assembly for legislation, former General Secretary of the Nigeria Labour Congress (NLC), Comrade John Odah told Daily Trust that state governors have no rights under the constitution to reject a negotiated national minimum wage. Odah who is the current Executive Secretary of the Organisation of Trade Unions of West Africa (OTUWA) noted that the minimum wage is under federal exclusive list and whatever is arrived at is binding on them as federating states. Going down memory lane, Odah said minimum wage right from the first one in civilian dispensation, 1981, legislated into law by the national assembly was implemented across the states. He explained that the state governments complied because the minimum wage is important as it is under federal exclusive list. He said state governors who are claiming that they are not able to or their states should be allowed to implement wages on their own are just doing it out of mischief, saying for one to have risen to the position of a state governor, he should know what is in the concurrent and the federal exclusive list. He recalled, "Through 1981, after the Sumonu led NLC embarked on a national strike asking for N300 minimum wage and then president Alhaji Shehu Shagari eventually settled with the NLC and a bill was sent to the national assembly where a minimum wage of N125 was legislated, it was paid across board in all the states. Even under the military, one of the things that the NLC under Pascal Bafyau, where the N125 minimum wage was upgraded to N250, it was during the time of General Babangida and again it was paid across board in all the states. When Oshiomole became NLC president, he was going round the states to ensure that the then minimum wage of N3000 which had been approved by the military under Abdul Salami Abubakar government was paid. When Obasanjo was elected president, we got a new national minimum wage of N5,500, it was implemented across the states." Odah said that labour was able to negotiate then with the oil producing states that receive more money than their counterparts in other part of the country to pay N5,700, above the N5,500 national minimum wage. "Then in 2011 when the N18, 000 was legislated, it was across board, so at no time did the states have to say they would pay a different wages because it is not their responsibilities. That is why the federal government negotiating team always includes representatives of state governments. Six governors represented the state governments at the current negotiation that had taken place. So their interest was taken into consideration and ability to pay had always been considered by organized labour each time we go on demand for minimum wage negotiation." He said any state that refuses to pay the minimum wage of N30,000 is breaking the law of the nation, just as he described the Nigerian Governors Forum (NGF) intervention as lawlessness of the highest order, adding that they lack the constitutional rights to reject or refuse to pay already negotiated national minimum wage and that they (NGF) are unknown to the law of the land. He denied the claim in some quarters that when workers salaries are increased, it will result in hyper inflation as witnessed during the popular Udoji pay package of 1975 saying the Udoji package came as a result of the oil boom. Following a successful transfer of power to civilian administration headed by President Olusegun Obasanjo, the NLC led then by Comrade Adams Oshiomhole began a fierce demand for a new wage and there was negotiation between 2000 and 2001. The demand of N5,500 for state workers and demand of N7,500 for the federal workers and oil-producing states workers were agreed to. At this point, Nigeria tried to follow the norms as applicable in other civilized parts of the world. There were provisions that the following year (2002) there would be a 15 per cent increase across board, and a 25 per cent increase in 2003. The current N18,000 minimum wage was achieved in 2010 through a well negotiated tripartite structure under President Goodluck Ebele Jonathan and signed into law by the National Assembly with a clear provisions that there will be constant review of the national minimum wage every five years. From the arrangement, the minimum wage was already due for a review since 2015. This gave rise to agitations from organized labour in the past three years which prompted the Buhari administration to inaugurate the Tripartite Committee on the National Minimum Wage led by Ms Ama Pepple, a former head of the civil service of the federation, to negotiate a desirable wage for Nigeria workers since last year (2017). Labour insists that President Muhammadu Buhari should uphold the N30,000 minimum wage it proposed and pushed through with the Tripartite Committee. Labour however have given the federal government uptill January 23rd to transmit the N30,000 national minimum wage to the National Assembly for legislation or face a nationwide industrial action.